Kura, meaning ‘treasure box’ in Japanese, is a new Japanese restaurant in Podgórze, situated by the new footbridge. It is part of what is becoming a mini- restaurant revolution in this up-and-coming neighbourhood. 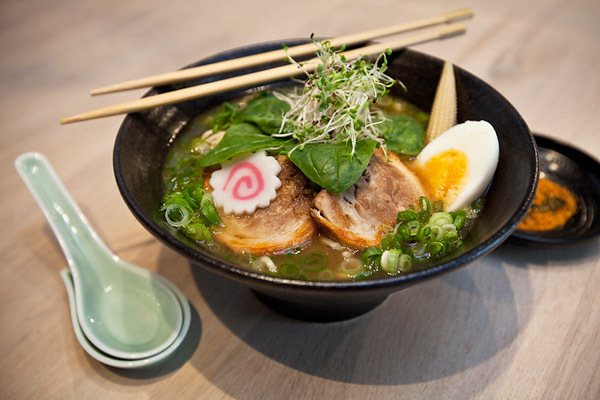 The restaurant’s full name: Kura – Noodle Shop and More, is somewhat misleading since it isn’t a shop and the focus is not overtly on noodles, but don’t let this put you off. 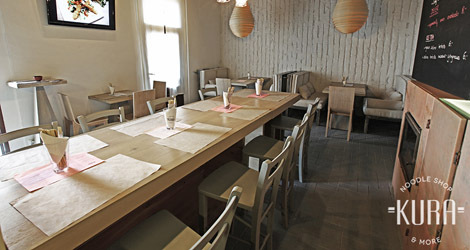 Previously situated in Kazimierz, the restaurant was moved here to take advantage of the open and airy location, and indeed the ambience of the place is fresh, clean and bright, with a view over the bridge and river. There are two rooms, one of which is the bar where cooks prepare food in front of guests, with fresh ingredients – rice, fish, chicken, seafood, vegetables and so on – on view. The back room resembles a traditional Japanese eatery with very low tables where one can sit on a cushion, oriental-style. Minimalist design, low lighting and relaxing music complete the laid-back atmosphere. The focus of Kura, according to the manager, is rather on cooked food than sushi, and on the day I visited, sushi was not even available (it is on the menu only from Friday to Sunday). Unfazed by this – sushi restaurants being two a penny in Krakow these days – I ordered a Japanese beer (Sapporo, but they also have Asahi and a few Polish micro-brews) and a salad called wakami sarada, which consisted of fresh green seaweed and cherry tomatoes with small pieces of tofu – a light and tasty starter. My partner’s dish of deep-fried tofu was equally tasty and an excellent entrée. After perusing the fairly brief but perfectly formed menu, I ordered tempura – deep-fried prawns and vegetables (red and green peppers, zucchini, aubergine etc) in batter. This dish can be a bit hit or miss – a previous visit to a Japanese restaurant in this town disappointed with expensive and greasy tempura – but this was perfectly done; crispy, fresh and delicious, and reasonably priced at around 20zl. Next up was ramen, which is a Japanese soup. A large, steaming bowl containing about half a litre of broth arrived – just what the doctor ordered with temperatures outside plummeting to -10C and below. The salty, tangy soup contained noodles with sliced pork, marinated egg, spinach and spring onions, and truly acted as a warming tonic as it went down. My mum would call it ‘a meal in itself.’ Finding a dish like this in Krakow is not easy to do, and I was delighted with it. My partner tried a dish called yakisoba – stir fried wheat noodles with chicken and vegetables, which looked and tasted both very appetizing and extremely healthy. Both dishes were priced around the 20–25zl mark, so a visit here won’t break the bank. Desserts here change daily, and appear on the blackboard, so I tried an unusual option – avocado mousse – which proved to be delightfully smooth, sweet, delicate and flavoursome. A superb, freshly ground coffee and a fiery glass of saki finished the meal and established a warm glow. I am extremely glad to have uncovered this gem. Despite Japanese restaurants becoming ubiquitous in Krakow, this one offers something that most of the others do not, and at very reasonable prices. Kura is a minimalist joy. Starting to doubt this writers credibility. Has anyone ever seen a negative review of a restaurant by him? Critic my ar%#. Drop In is a restaurant recommendation. Stuart visits a lot of places, but we only feature the ones he likes. We don’t feel there is much point devoting a whole page in the magazine to a restaurant that isn’t any good.